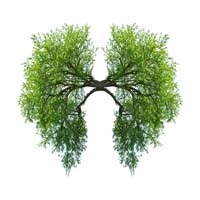 The air we breathe is vital to our overall health, from our lung tissue to our circulatory system to our digestion. Despite the importance of air quality, many people don’t stop to consider whether their health issues are caused, or exacerbated, by the immediate air around them. In recent years, as pollutants and allergens have become more prevalent, more research has been dedicated to examining how air quality affects us. Scientists are also exploring how we can purify the air we breathe by reducing pollution using technology and natural solutions like salt crystal lamps and salt inhalers. Ions are positively or negatively charged atoms; these unseen particles greatly influence the quality of the air in an area. But don’t let the naming conventions fool you – positive ions reduce the air quality while negative ions help improve it. The health issues of positive and negative ions go beyond air quality. Research has shown that high levels of positive ions can cause an overproduction of serotonin, which can lead to a plethora of mental, physical and emotional problems. This is in direct contrast with negative ions, which have been shown to improve mood and ease physical ailments. A study performed by Columbia University showed that an increase in exposure to negative ions generated by an air purifier was as effective as using Prozac and Zolof to treat depression. For those that are concerned with minimizing environmental impacts, there are possible natural alternatives to neutralizing the air with negative ions. Alternatives such as Himalayan salt lamps are discussed in more detail below. On the surface it may be assumed that the air quality indoors is better than outdoors; in most areas that isn’t the case when it comes to ionic charge. As noted above several factors affect the charge of ions in the air. Unfortunately, the positive contributing factors, such as moving air and water, aren’t as conducive indoors. In addition, indoor areas are often filled with pollutant-generating products like building supplies and cleaning products. 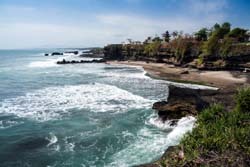 Out in natural environments- like the mountains, the beach and the woods - there’s typically 2,000 negative ions per cubic centimeter. In the average office there are only a few hundred negative ions. Considering that the vast majority of our time is spent indoors, it is crucial that steps are taken to increase the presence of negative ions and improve air quality. Information on indoor air quality released by the Texas Department of Insurance did note that electronic devices can produce negative ions which clean the air. However, negative ions produced by these devices tend to stick to particles that then bind to furniture and walls. These devices also have the negative side-effect of producing additional electronic frequencies. Results from research like this exemplify the need to find natural alternatives to negative ion production. There is a simple, natural solution to balancing out the positive ions in the air – salt lamps. The naturally occurring Himalayan salt used in these lamps promote a healthier indoor environment through ionization. Negative ions tend to attach themselves to the oxygen molecules in water. 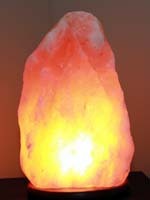 When lit, Himalayan salt rock lamps are capable of attracting water molecules and absorbing them. The salt and water mix, becoming a neutral substance that is then released as a vapor. The result is a release of ions in the air, of which there is a slight increase in negative ions. This process has led to salt crystal lamps being deemed natural ion generators. Light therapy has been used for years to improve cell production, which has a positive impact on people’s wellbeing. The electromagnetic wavelengths and color influences the affects of the therapeutic light. Salt lamps are used in light therapy for a variety of purposes depending on their crystalline color structure. In today’s world we are surrounded by electronics – televisions, computers, cell phones, radios. These electronics emit electronic frequencies that are far above those that occur naturally in the environment and in the human body. 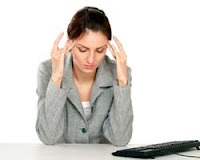 Exposure to increased frequencies can negatively affect a person’s health. Salt is neutral, having an electromagnetic field of approximately 7.83 Hz per second, the natural frequency level. Salt lamps are thought to promote electromagnetic oscillation, which balances and neutralizes the higher, artificial frequencies. Lastly, unlike ion air purifying machines that are built of plastics and metals, salt lamps are primarily comprised of natural elements. When the goal is to improve air quality the environmental impact of the mechanism being used to clean the air must also be considered. In some instances, the carbon footprint of the machine is enough to nullify the overall benefits it provides. As a natural occurring element, salt lamps have a much smaller carbon footprint. All Himalayan Salt Lamps featured by The OM Shoppe use salt that has been mined by hand, where the use of explosives is strictly prohibited, so that the Himalayan Salt Lights remain pure and the crystalline structure is preserved. In addition to offering the highest quality salt crystal lamps, Himalayan salt crystal lamps and salt lights, The OM Shoppe also offers the best value with Free Shipping on all orders over $49.99 within the contiguous United States.